Once a month I will be featuring either a product or trend, a chef, a restaurant or something great relating to food. 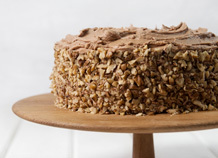 Lesson one in the art of baking is "Ready, steady, bake"
In this course you learn basics, tips and essentials as well as how to bake an espresso cake. Once you have completed the steps, you can then move onto the next level.